Georg Wilhelm Saxer (? - 1740) was a German Baroque composer and organist. Not much of him is known. He was a pupil of Georg Böhm. In 1734 he was succesor of Böhm of the Sankt Johanniskirche in Lüneburg. Before 1734 he was organist of the Lambertikirche in Lüneburg. From. Fortunato Chelleri (1690 -1757) was an Italian Baroque composer. 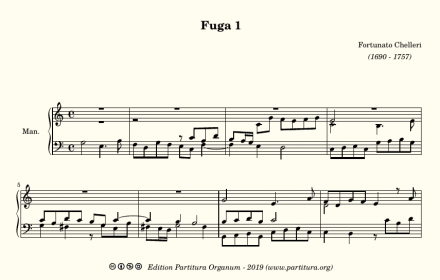 From his hand is a small bundle of 6 Fughe per il organo, composed around 1725.The fifth of these fugues is actually not a fugue at all. It is more like one of the two part inventions of J. S.Bach. And. 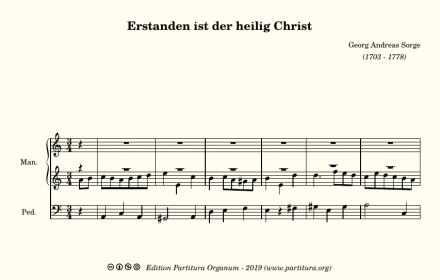 Sorge's prelude to "Erstanden ist der heilig Christ is not as exuberant as his prelude to "Heut triumphiret Gottes Sohn" I uploaded two days ago. One could call it even strange that a prelude with this title is written in a minor. Yet the tripple meter and the subtle three. Fortunato Chelleri (1690 -1757) was an Italian Baroque composer. 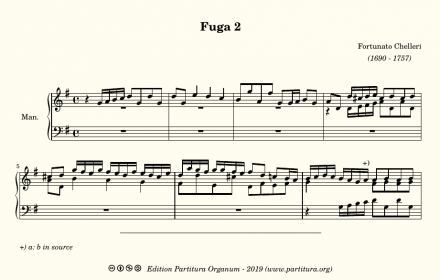 From his hand is a small bundle of 6 Fughe per il organo, composed around 1725. They are works that forshadow the galant and even the classical period. 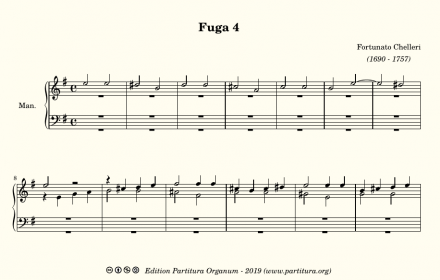 Each of the fugues starts as a 4 part piece and each of. 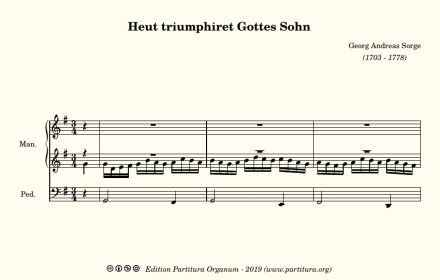 Sorge's prelude to "Heut triumphiret Gottes Sohn" has an introduction with two voices plus a bass voice. When the choral melody enters, the accompanying textures reduces to one voice and bass voice. 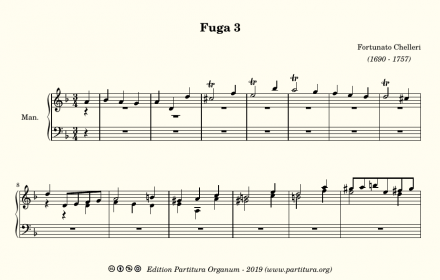 Sorge creates and exuberant, triumphant piece, perfect for the choral's text. The recording was done on the sample. 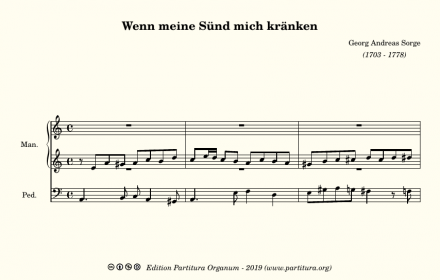 Sorge's prelude to "Wenn meine Sünd mich kränken" is one of the 20 or something preludes by Sorge contained in manuscript Go.S. 597. 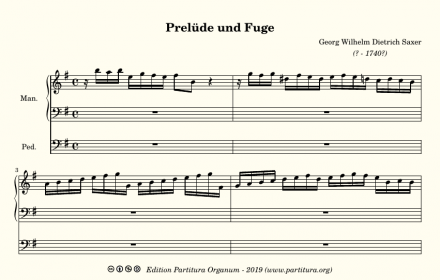 Sorge's preludes in this collection are setup as a Trio. The chorale melody is accompanied by another voice and a bass voice. Some of them have an. 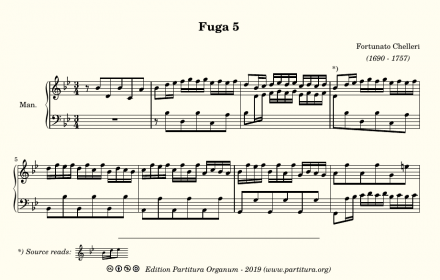 Ernest Grosjean (1844 - 1936) published "Pièces pour orgue ou harmonium", a set of 56 pieces in two volumes, in 1902. The first volume contains 33 easy pieces, that can be played without the use of pedals. 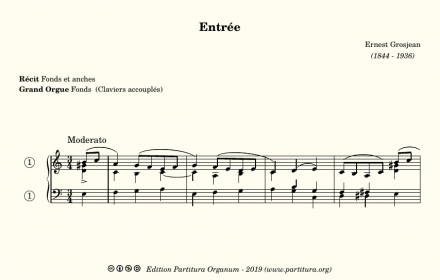 This Entrée is the first piece in the section called "Pièces Funèbres", pieces. The prelude of this work is a beautifull, Mendelsohn-like, piece. It is not unlike the third part of Mendelsohn's fourth Sonata, even if that piece is in F major and this one in a minor. The left hand plays the melody of the chorale "Warum betrübst du dich, mein Herz",. Fortunato Chelleri (1690 -1757) was an Italian Baroque composer. Chelleri's father was from German origin, but he had migrated to Italy and married an Italian woman. Fortunato Chelleri received training in Parma and Piacenza in singing, playing the cello and keyboard instruments and in composition. In his early career he. 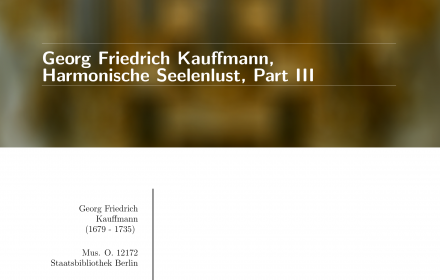 Georg Friedrich Kauffmann (1679 - 1735), a German composer and organist, is the autor of the "Harmonische Seelenlust". 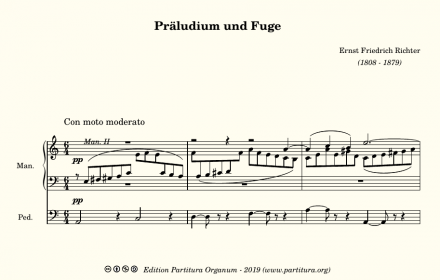 This work, containing all of his known chorale preludes together with figured bass settings for all but one of the used chorale melodies, was first initiated by Kauffmann as a serial publication.. 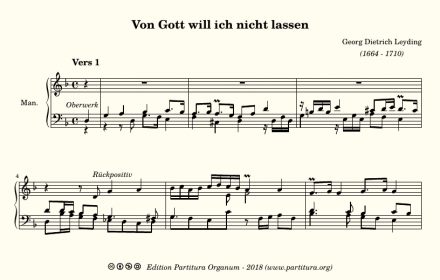 The partitia "Von Gott wil ich nicht lassen" is one of Leyding's two remaining chorale preludes (the other one was posted a week ago on this site). It consists of a set of six variations on the chorale melody. The first three are manualiter, the last three feature a. 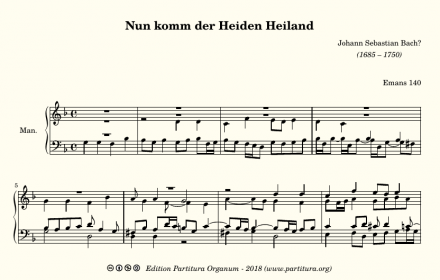 This piece is one of the many choral preludes of which the authorship of Johann Sebastian Bach is doubtfull. It did not get a BWV-number, but Emans listed it in his catalogue of doubtfull Bach works, hence the designation "Emans 140". The source is a manuscript, written by Christian Heinrich.